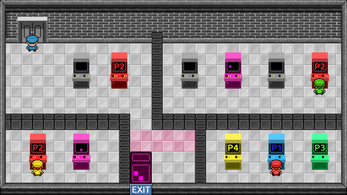 You enter an Arcade Game Center and try to find your way through the different rooms. 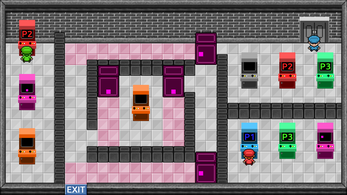 To reach the exit you have to control other characters by playing them on the arcades, Some arcades have abilities like moving blocks or teleport from one to another. There is a total of 10 levels to play right now ! Use WASD to move and SHIFT to interact. Tap R to reset the current stage. Some of those puzzles were pretty devious. I forget if I got stuck on 5 or 6, but the one directly after was 'This one's easy'. Looking at it at first I was a bit turned off by the visuals, but that didn't really matter as soon as I got invested in the puzzles. I think spent more than an hour playing. You really picked a nice comfy song for the background, it never grated on me at all and kept me in a good mood. One minor complaint is that some of the sprites were a bit thick and easy to get stuck on or bump into, but I know these projects are made quickly, so its really quite minor. You should definitely touch up the game after the contest though, it was pretty enjoyable and challenging. Interesting game! I liked the puzzle mechanic, and the meta aspect is quite present in this one. What engine did you use? The bug is still happening :c I tried to leave the stage with green, but it wouldn't allow me. It took me a little longer to figure out how to get blue from the stage. An alternative is putting a star on his head and at the end of the level to signify he has to be the one that exits.